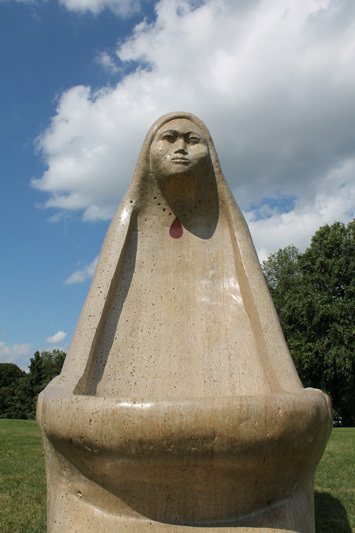 On October 16, 2006, two new sculptures were officially dedicated in Indian Mounds Park. They were part of the Minnesota Rocks! International Stone Carving Symposium. It was a Public Art Saint Paul program which brought sculptors from around the world to spend six weeks educating the people about sculpture and creating works of art to be placed in public spaces. The two works described below were created at the event and came to rest in this local park. 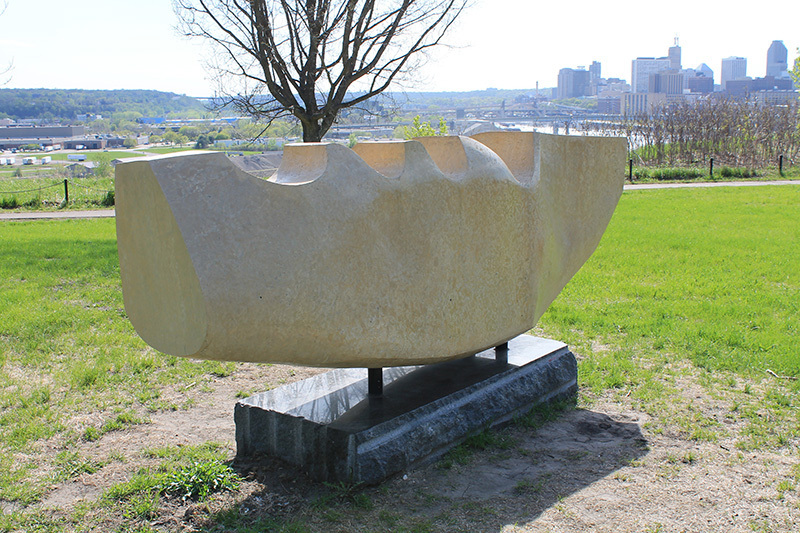 According to its artist, "Usumacinta Meets the Mississippi" is meant to represent the ties between the waters of Mexico City and the waters of the Mississippi River. The sculpture is located just off Mounds Park Boulevard near the intersection with McLean. Javier Del Cueto’s is well-known for his work in both ceramic and stone and teaches sculpture in Mexico City. He studied in Spain and also took sculpture courses with ceramic and stoneware masters in his homeland. He started his work in stone sculpture in 1988 with a famed Japanese sculptor. When Javier came to the symposium he was not familiar with Saint Paul, but he became enamored by the Mississippi River and it became the inspiration for this work. The sculpture is made up of two pieces of limestone from the Vetter Quarry in Kasota, Minnesota. The main sculpture is attached to the base with four steel rods. Javier explained that “Mexico is a country with a strong tradition in stone carving from Pre-Hispanic and Colonial times to the present.” One of his goals is to carry on and help add to the appreciation of this art form in his homeland. “I am very interested in revitalizing stone carving for contemporary sculpture. I consider stone an ideal material for sculpture with unlimited possibilities and great potential, and it lasts forever.” Del Cueto was not able to attend the dedication but the Mexican and Aztec culture were well represented by the local Aztec Mecia Cuctemec dancers. 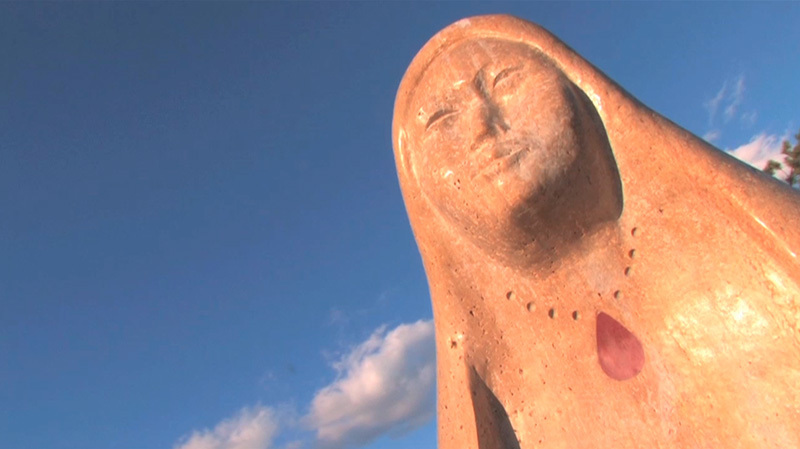 This sculpture is a representation of a Native American woman made of dolomitic limestone. It was originally slated to be in another part of the park, but when Duane “Dewey” Goodwin, the artist, saw the Indian Mounds, he felt that it belonged on the knoll across the boulevard, just west of Earl Street. He wants people to see Sacred Dish as representative of both the strength and the giving of the Native American people and make them aware of the area’s rich Native American history. Goodwin dedicated Sacred Bowl to his eighty-seven year-old mother. At the event, a number of rituals highlighted the artist’s Ojibwa heritage. One man played Native American flute, while Goodwin burned sage and held a traditional pipe ceremony. Goodwin, who lives in Bemidji, a member of the White Earth Band of Ojibwe. He studied at the Minneapolis College of Art and Design, which, he said, brought a contemporary perspective to his work. Dewey had a dream just before he was finishing his work. In it he saw a tear coming from the statue. He decided to imbed a pipestone tear below the woman’s eye. It represents the sorrow that has been experienced by women of all backgrounds. Steve Trimble, “The Park Rocks!,” Saint Paul Historical, accessed April 19, 2019, https://saintpaulhistorical.com/items/show/24.